Last week we reported some preliminary findings on the local SW Florida real estate market pending release of official numbers this week. Well, it’s official as the numbers are out. The foreclosure moratorium has taken its effect on closings and prices. Single family home sales were down 28.10% from last October’s figures, and down 7.8% from last month’s figures. Median home sales prices were down 1.75% from last October, and down 4.66% from last month’s figure. 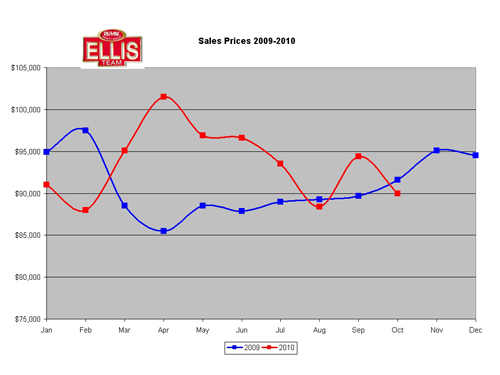 Median sale price for October 2010 stands at $90,000, essentially where they were back in 1996. The shame of it all is that the temporary freeze isn’t going to cause more delinquent owners to stay in their properties. If they don’t pay they won’t stay. We are all in agreement that banks need to follow rules when foreclosing, and especially when evicting people. As a practical matter prolonging the time a home sits before a bank can sell it hurts the neighborhood, the real estate market, and the economy. The LA Times recently did a study on the effects of foreclosures on the market, and they compared California and Florida as sister states with closely aligned foreclosure statistics. The California market is up in price about 20% from the bottom in April of 2009 versus Florida where prices are struggling to find a bottom in many parts. The study concludes that California is more efficient and less complicated making it easier for banks to seize and resell homes when homeowners don’t pay. Florida is one of 22 states that require repossessions to be approved by a judge, which adds time and tasks to the foreclosure process. By extending the process, they’re extending the rebound time. The LA Times article also looks at the Standard & Poor’s/Case-Shiller index which also shows prices up in many cities in California while down in the major cities of Florida. We can’t change Florida’s law, so we’re stuck with the process of slowly bringing foreclosures to the market over time. What we’re not in favor of is arbitrarily adding to that time. We were especially critical of Obama’s foreclosure moratorium which slowed the recovery process back in 2009 by slowing down the process even further. The government’s intention was to somehow provide retention for struggling homeowners, and while it was a noble cause it was a flawed scheme that wasn’t well thought out and did more harm than good. If a homeowner lost their job, tacking on extra interest and increasing payments later on wasn’t going to make the home more affordable if the homeowner already couldn’t afford it. Raising the payment later wasn’t going to help any struggling homeowner who was in trouble, and it certainly wasn’t going to help the market. Real estate is 32% of GDP (Gross Domestic Product) which means it would ultimately hurt the economy as well. The government finally got the message and laid off on the popular with voters but largely ineffective moratorium on foreclosures, and along came the bank issue failing to properly follow procedures on some foreclosures in those 22 states. We are seeing the effects of that now which is prolonging the recovery. Last week we predicted sales would be off 8.45% from last month’s numbers and official numbers indicate they were down 7.8%, so we were pretty close. We do see some pent-up demand and an increase in pending sales activity which could bode well going forward. We are going to keep a close eye on inventory levels, both distressed sales and non-distressed sales and pending sales. We’ll track these against actual closings and monitor for any changes in the market. So far since the moratoriums began Oct 1 for occupied properties, we’ve seen an impact, but there are signs this will be made up in coming months. With season upon us we’d hate to miss any sales opportunities as buyers are buying sooner this year. The sooner we get these properties to the market and sold, the sooner our real estate market can heal like California is doing and the sooner our economy can improve, which I think everyone can agree on would make for better times in SW Florida and across our nation. The good news is the signs are there. All we need now is time, action, and results, and with a little luck we’ll be on our way and 2005-2010 will be in our rear-view mirror. Posted in Southwest Florida Real Estate.Tagged Cape Coral real estate market, foreclosure moratorium, Fort Myers real estate market, Lee County Florida home prices.